In 1591, shortly before the Edo period (1603-1867), a man who was called Yoichi Iseno opened the public bath at Zenigamebashi in the city of Edo, today’s Tokyo. It is said that this is the origin of the sento. Yoichi’s bath was a steam bath. (See the section below, Todana-buro.) In those days, Edo was still a small village in Kanto area. However, in 1590 Ieyasu Tokugawa settled in the land in order to build a city there. Ieyasu became the first shogun of the Tokugawa shogunate in 1603. As a result, the number of people coming to Edo city increased and the yuyas were opened one after another. Between the early and late Edo period, most sentos were steam bath. 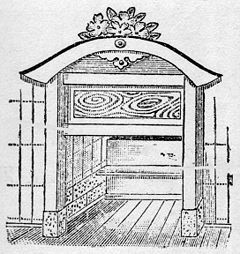 The steam bath was called “todana-buro.” This was a kind of sauna and people took a bath by soaking only the lower half of the body and men and women took the bath together. 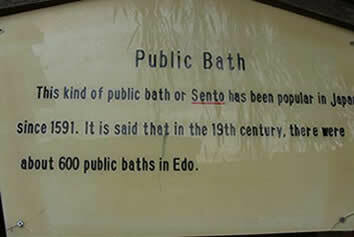 At that time common people usually used sento because they did not have their own bath. Sue-buro that allowed people to soak shoulder-deep in a bath first appeared in the Edo period or the early 17th century. It was different from mushi-buro or a steam bath. Teppo-buro is a more modern bath system, which used a big vertical metal cylinder to heat the water in the bathtub. Goemon-buro was a large bathtub with an iron bottom heated by the fire below and the name was derived from Goemon Ishikawa, a bandit who was sentenced to execution by being boiled alive in a cauldron in Kyoto. People took goemon-buro by stepping on a wooden board or wearing wooden sandals not to get burnt. The number of sento increased in Edo city as a place for socialization. The bathhouses hired yuna, female prostitutes, who took care of customers at yukaku, licensed pleasure quarter such as Yoshiwara (north of present Taito-ku, Tokyo Prefecture). Sento, then called yuya, became one of the most flourishing businesses consequently, and most owners built the second floor and started a club for men there. The Edo government banished yuna from sento, however, and forced them to work in yukaku at Yoshiwara.